Velvety smooth ! Kairichi Udid Methi with freshly made raw mango pickle. This is an heirloom recipe that is very dear to my heart. This is my mom’s recipe. It brings back many happy memories that I shared with her. Of course, my curry never ever tastes as good as my mom’s did but I keep trying my best for my daughter. Rice bowl with this curry is my daughter’s comfort food. So I love making it for her. Mangoes, both raw and ripe, are flooding the markets now. In India, right from the fragrant spring blossoms, this king of fruits announces its grand arrival! Early in the summer season, raw mangoes are used for making pickles, chutneys, drinks and curries. This is one such coconut based curry, very typical of the coastal region my ancestors came from. Freshly scraped coconut, coconut milk and coconut oil are used to make this curry. I love the foamy and absolutely delectable flavor of coconut milk. So when I spotted the coconut cream can at Trader Joes, I had to check it out. I used only ½ cup of the coconut cream for this velvety curry. I have streamlined the recipe using just coconut cream. In the traditional recipe, freshly scraped coconut is ground with the spices and to extract coconut milk. Yes, you know me;) Always trying to find a short cut without compromising the taste. I am hoping that you find this recipe more accessible, as it cuts down on preparation time. Because I seriously do not want you to miss on this uniquely flavorful curry! It is sweet and sour and spicy and ooooh so good! 1 teaspoon dried tamarind pods or ½ teaspoon tamarind concentrate (optional) I use it only if the raw mango is not very sour. Make the masala paste- Heat the oil in a pan over medium heat. 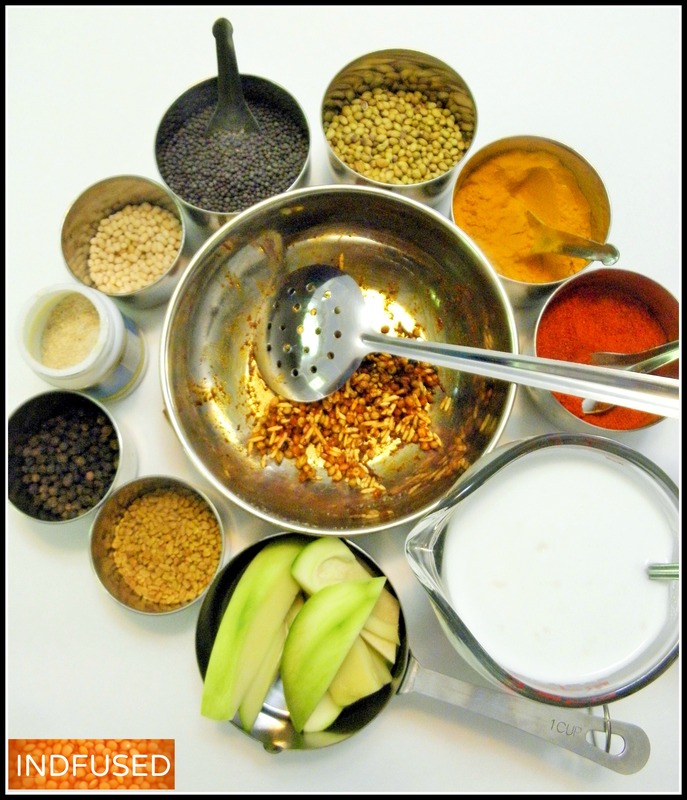 Lower the heat and add the urad dal, rice, coriander seeds and the methi seeds. Let them fry until they are fragrant and golden in color, about 1 to 2 minutes. Shut the heat off and add the red chili powder. Stir with the hot ingredients, to roast the chili powder. Let it cool. Then grind the mixture with the 1/3 cup water and the tamarind (if needed). Set aside. In a saucepan, heat the teaspoon of coconut oil over medium heat. Add the mustard seeds, methi seeds and hing powder. When the mustard starts to splutter, add the raw mango pieces. Give it a quick stir to coat the mango pieces with the tempered spices. Add the turmeric powder and stir again for about 30 seconds or so. Add the 1 cup of water and the sea salt. When the water comes to a boil, reduce the heat, cover the pan and let the raw mango cook until tender, about 4 to 5 minutes. Remove the lid, add the jaggery and stir until dissolved. Add the ground spice mixture and the coconut cream mixture. Stir well.Let the curry simmer on low for a few minutes. Do not let it come to a rolling boil. Serve with rice and freshly made raw mango pickles! I am taking the Kairichi Udid Methi to the fiesta hosted by the ever gracious Angie co-hosted by Quinn and Naina . Thank you so much. I try my best. My mom was an amazing cook and had a great gift of teaching cooking classes with minute details too. Oooooooooooooo….. How delicious. Just made Methamba yesterday. This over the weekend, for sure! Aruna, this is my favorite, just as it is my daughters. I love Methamba too! Yummy!! Never had a kairi chi curry before! This is truly delicious. Do try it. 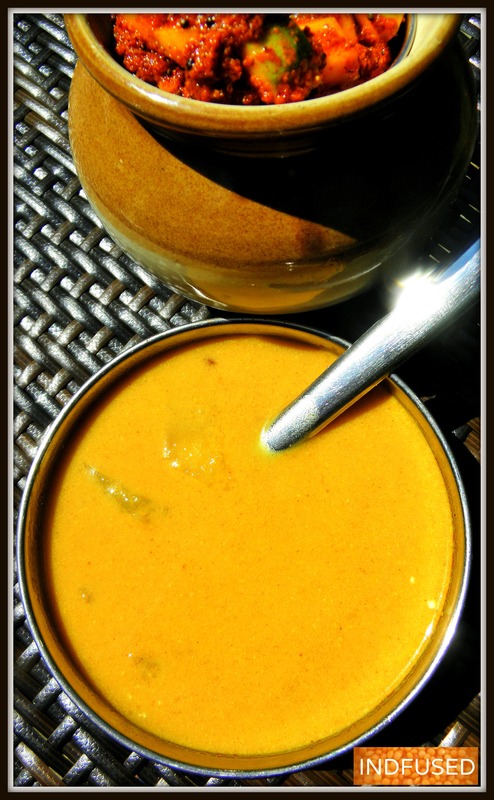 Oh wow Sandhya, such delicious creaminess going on in this curry. I’m salivating just reading the ingredients……and that raw mango pickle! wow! Goan cooking is very much coconut based too, but lately a lot of that is changing even in Goa, I think folks are now using yogurt. But I’d love a real coconut curry and yours looks amazing! Thanks Loretta. This is Saraswat cuisine that originated in Goa too. I used to make it once in a while when coconut had a bad rap:) and switched to yogurt with the sol kadhi:) but now coconut is all good again…ha ha. This curry is also made with shrimp in it. Both curries are truly yummy! Thank you Sonal! Do let me know how you like it! I bet this is just heavenly! Yes I love it! Thank you so much for your sweet comment! Hi Sandhya can I know what hapens if the coconut milk comes to a rolling boil? Simmy, Depending on which coconut milk you are using, it may either curdle or have an oily film on top. So It is best to simmer it, without boiling it. There will be a change in the taste too.